EDMONTON, June 13, 2018 /CNW/ - Altiplano Minerals Ltd. (TSXV: APN) (OTCQB: ALTPF) (FWB:9AJ1) ("APN" or the "Company") is pleased to report commencement of underground drilling at the historic Maria Luisa Gold-Copper Mine ("Maria Luisa") near La Serena, Chile. CEO John Williamson stated, "Recent underground sampling results from the lowest accessible level (841M) have confirmed the records of historic high-grade production at Maria Luisa. Based on this, APN has habilitated this level to accommodate underground drilling in order to confirm continuation of these grades at depth, and is planning to extract a 5,000 tonne bulk sample". Historic production records cited by Apex in their February 10, 2017 Technical Report (news released March 15, 2017) show that veins at Maria Luisa yielded an average grade of 6.85 g/t Au and 1.89 % Cu in 600 tonnes mined between 2011 and 2015, including approximately 14 tonnes with 25.8 g/t Au and 1.69 % Cu. 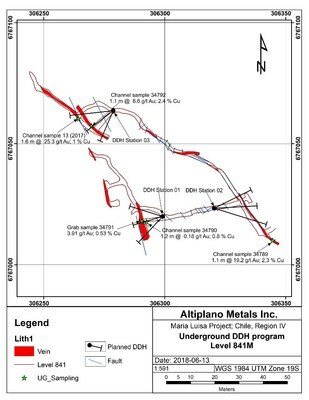 In 2017, APN reported channel chip samples of up to 25 g/t Au across 1.6 m (news released June 21, 2017), and recent channel sampling results (see Figure 2 below) have confirmed the presence of these high-grades at the lowest level with up to 19.21 g/t Au and 2.27 % Cu across 1.1 m (see Figure 1 below). Surface diamond drilling completed in 2017, intersected continuation of the veins ~50 m underneath the 841M Level, but poor core recovery of only 50% indicates that the grades assayed, albeit good (1 m @ 6.95 g/t Au and 0.03% Cu), may have underestimated the true grade. The Company will now conduct an underground drilling program of 3 fences of 3-4 short holes close to the observed high-grade sources to better test the opportunity at Maria Luisa. Between April and June 2018, the Company conducted underground work to expand the 841M level and improve access in order to accommodate new underground drilling where sampling and mapping have delineated high-grade gold and copper mineralization of similar tenor to the gold-copper ore mined and sold by historical operators. Following the drill testing the Company intends to extract a 5,000 tonne bulk sample to confirm the potential to produce a 43-101 resource estimation. 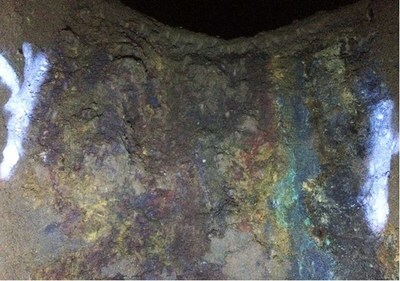 In order to extract this sample, the Company is planning to rehabilitate and deepen a shaft that presently goes from surface to the 858M level. The shaft will be extended down to the 835M level (23 m deeper), and will enable extraction of mineralized vein material from the bottom. Altiplano Metals Inc. (APN: TSX-V) is a mineral exploration company focused on evaluating and acquiring projects with significant potential for advancement from discovery through to production, in Canada and abroad. Management has a substantial record of success in capitalizing opportunity, overcoming challenges and building shareholder value. Additional information concerning Altiplano can be found on its website at www.altiplanominerals.com.